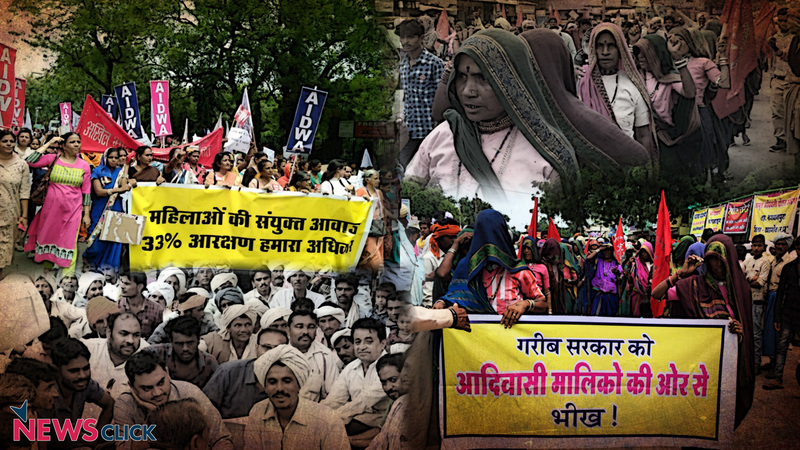 The protest by tribals in Madhya Pradesh’s Khargone has entered the 10th day amidst the silence of the authorities. NEW DELHI: Marching ahead in the scorching heat in Khargone -- a small town in south-west of Madhya Pradesh, tribal women chant “gareeb sarkar ko bheek do” (give aid to the poor government). They are irked by officials’ statements that there is a “shortage” of funds for their rehabilitation as per court orders, the adivasis contributed a rupee each to collect Rs 440 as “alms” for the Shivraj Chouhan government saying “garib Shivraj sarkar ke liye adivasi malikon ke ore se yeh bheek hai” (This is a dole from our side for the ‘poor’ Shivraj government). They also gave, in alms, a toy helicopter, saying “helicopter tumhara, zameen hamari” (Helicopter is Yours, Land is Ours)! The acutely embarrassed district administration refused to accept the “alms”, whereupon the adivasis demanded to know that when the government accepts bheek (alms) from corporate houses like Adani and Ambani, why should they not accept it from the public? They left the alms at the gate of the collectorate, sais sources close to the agitating tribals. This is part of the protest against the Madhya Pradesh state authorities which has entered the 10th day. The protesting Barela tribals under the banner of Jagrit Adivasi Dalit Sangathan (JADS), have been demanding rehabilitation since 2012 when land for the Kharak dam was first acquired. The protests come after a consistent lopsided approach of the state administration, as meetings with state officials have yielded no conclusive response and the silence of the Chief Minister is blatant. Two years after the Supreme Court passed an order to provide compensation, villagers displaced by the construction of the Kharak dam await in despair, anger and some in hope of getting their rightful amount. Due to the construction of the Kharak dam, over 300 families across five villages ended up getting displaced, with some fields submerging under the water coming from the dam. The approximate cost of compensation to be given out the tribals is Rs 20 crore, the same amount of money the Madhya Pradesh government spends on providing tea and refreshments to its cabinet. Intensifying their agitation the tribals have now written to Chief Minister Shivraj Singh Chouhan questioning him “are the adivasis not citizens, is this not our government?”. Affected families have been demanding rehabilitation under Madhya Pradesh's rehabilitation policies since 2013. Their protests were met with severe repression in which the adivasis - including women and children were brutally lathi-charged and 27 people, including seven women, were arrested. The matter went to the High Court which endorsed their claim to rehabilitation in July 2016. In January 2017, the Supreme Court also categorically ordered that they be rehabilitated under the most beneficial provisions of the MP Rehabilitation Policy of 2002 and NVDA policy of 2008. Upon Supreme Court orders, three Grievance Redressal Authorities were also set up to examine their claims, and these GRAs passed orders for payments ranging from Rs 3.50 lakh to Rs 11.50 lakh in 129 cases, in May-June 2018. However, the MP government is now refusing to make the payments, and senior officials are threatening to trap the adivasis in endless rounds of litigation. The GRAs were also summarily wound up just before they could pass orders with respect to 97 families. Outraged by this blatant illegality and contempt of Supreme Court orders, adivasis have been on dharna outside the Collectorate at Khargone for the past 10 days. Speaking to NewsClick, Tejasvita, a member of the JADS, pointed out that the tribals had not received a single penny in compensation ever since the proceedings got over. She said there were multiple discrepancies in how the displaced people were assessed, “Ideally the tribals should have been compensated and rehabilitated six months prior to the construction, many had to struggle to get themselves recognised as displaced people, in some instances children had been made part of the list and parents were not included on the same”, she added. With prevailing negligence on the part of the state, the court interventions urged the state government to speed up the compensation process. However, the state government is yet to give out any concrete solution to the people. “Is not obeying court orders, not a contempt of the court, they (the government) is legally answerable to us” said Madhuri. Currently, the protestors are having to run from pillar to post to get a response from the state officials. On Saturday, after building up intense pressure on the collector the tribals could garner his attention, even then no conclusive response was given to them. Prior to these developments, the state government had also vehemently denied that there exists a mechanism under which the tribals could be compensated. The claims of the government were refuted by both Narmada Bachao Andolan (NBA) and the JADS as they explained that under the state policy of 2002 and the Narmada Policy of 2008, the tribals deserved rightful compensation and rehabilitation. The non-implementation of the court orders has now led JADS into filing a fresh petition against the government on the charges of contempt of court. According to a previous press release by the NBA, the construction of the Kharak dam was started forcefully. The press release states, “sub-divisional magistrate (SDM) Jitendra Singh Chouhan, along with 150 police personnel, arrived at village Choukhande with an earth-work machine and tried to start work on the dam forcibly, When villagers tried to speak to the SDM, he ordered a lathi-charge.” The NBA had also warned of illegal accusation of land as the dam had not received any clearance under the Forest Conservation Act and environment clearance under provisions of the Environment (Protection) Act. Despite this, the state government started land acquisition for the dam in 2011; Additionally, NBA had also expressed fears that structure will submerge seven villages in the Badwani and Khargone districts. Since July 2012, some people in villages Juna Bilwa, Kaniapani and Choukhand in Khargone district were forced to accept paltry compensation of Rs 40,000 per acre (0.4 hectare) against collector’s guidelines which put the compensation amount at Rs 1.60 lakh for non-irrigated land and Rs 3.20 lakh for irrigated land. The people were told they would be paid compensation in three instalments and if they protested they would be jailed until the completion of the project. Since the election of 2013, to the upcoming elections in the state this year-end, the issue of compensation and rehabilitation to the tribal populations remains unsolved. With the state government refusing to budge from its stance, the protestors are asking some tough questions to the Chief Minister-- Is the government above the rule of law? Is Madhya Pradesh no state for adivasis? Many on the ground believe that the issue is not limited to the Kharak dam, the brazen denial of the compensation by the government comes in as a mechanism to systematically deny the tribal population of their rights to land and livelihood and is a prime example of targeted uprooting of the tribal population.